All around the world, wherever traffic lights beckon cars to traverse intersections in an orderly fashion, one man keeps pedestrians safe. He is one of the most recognizable figures on the planet and children are taught to respect and obey him from a very young age. He stands as a silent sentinel, a helpful stranger, an essential part of the urban landscape guiding walkers young and old across the street. He has many names, but one of the most common is Walking Man. He is, of course, the lighted human figure that appears on traffic signals to tell pedestrians when it’s safe to walk across the street. Surprisingly, the Walking Man symbol can differ significantly from city to city in the same country, and even more widely between countries. There are stick men, men wearing hats, men hunched over while they walk – and even walking girls. 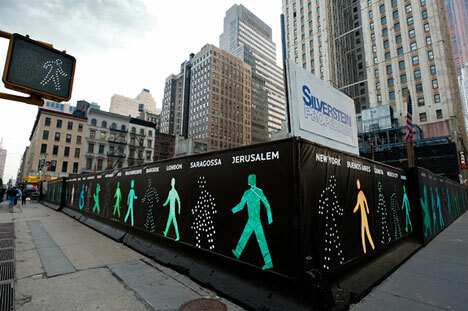 The Walking Men Worldwide project is the work of artist Maya Barkai. 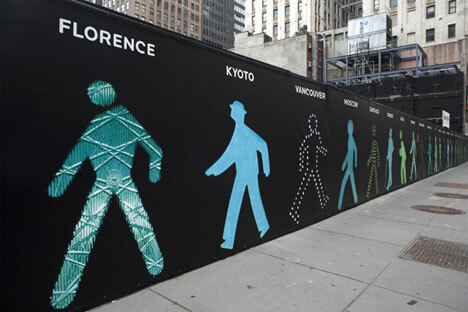 In 2004, following NYC Mayor Bloomberg’s announcement that the city would start implementing more pedestrian-friendly street symbols, the artist started looking at the city’s walking man. Admiring his character, she got curious about walking man imagery from other cities. She realized that they are somewhat standardized, but still very individual. But no matter where the walking man is or what form he takes, he is always an essential fixture of the city. Maya put out a call to artists and photographers all around the world, asking them to snap pictures of the walking men in their home cities and send them to her. The responses she received allowed the artist to create her first public showing of the exhibit: a fence around a construction project in Manhattan. It’s a part of the Re: Construction public art project, which aims to make the many construction sites in NYC less visually obtrusive and more friendly. A small version of the overall project, Walking Men 99 shows 99 walking men images from cities around the world. As she assembled the various images from all over the planet, Maya realized that the walking men each told a story about the urban environment they called home. 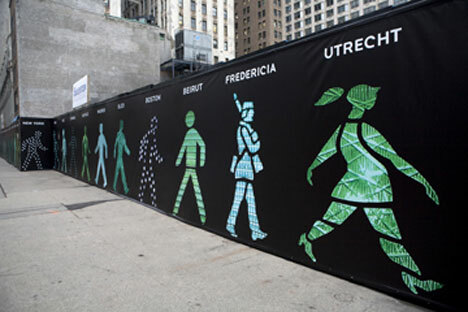 The 99 figures are walking now around 99 Church Street in Manhattan and will remain there through the end of 2010.